The Union budget was announced by the Honorable Finance Minister of India, Mr. Arun Jaitley on the 1st of February, 2017. This budget had many firsts. For the first time the Union budget was announced on the first day of February and not the last. Also, for the first time the Railway budget was not a separate affair, it was clubbed with the Union budget. The highlights of the budget included the focus on pro-poor schemes, huge spending on infrastructure projects and farmer welfare schemes. Not much was changed when it came to the tax structure, besides slashing the tax rate to 5% for the lowest taxable bracket. In fact, indirect taxes were not touched at all as the Goods and Services Tax is expected to become a reality soon. So how should one judge this edition of the Union budget? Was it growth oriented? Will it serve the needs of the country? Did it really deliver? These were the questions that many had and the students of the National Institute of Industrial Engineering (NITIE), Mumbai were no different. Hence, to provide some clarity and insights into the budget, a ‘Post Budget Analysis’ was held in the institute on the 8th of February. This was the third edition of the event and as always, it was organised by $treet, the ‘Finance Forum’ at the institute. The eminent panellists for the event included Ms. Shweta Agarwal, Chief Financial Officer, Paragon Partners; Mr. Piyush Garg, EVP and CIO, ICICI Securities Ltd.; Mr. Manas Garg, Chief Financial Officer, Wockhardt Limited and NITIE’s very own, Prof. Dr. M. Venkateshwarlu who is a senior faculty in the Finance area. The Dean of Student Affairs at the institute, Prof. Ashok K. Pundir was also present for the all-important event. The discussion was moderated by Mr. Roy Eddington Charles, Mentor, Roy Eddington-Charles and Associates. Prof. Pundir welcomed the guests and evoked memories of eminent jurist, Nani Palkhivala’s budget analysis in his address. Mr. Charles then took over, giving his objective take on the budget. He challenged the notion that this year’s budget was ‘boring’, making a very enlightening comment- “Fiction is interesting, facts are boring.” He then listed down the highlights of the budget and emphasised on the ‘will’ of the Government with regards to poverty alleviation. He advised the students to study in detail the concept of electoral bonds and commercial mining, from the point of view of the budget. In her address, Ms. Agarwal focused on the area of taxation, covering the field widely. She talked at length on the topic of corporate taxes and mentioned the steps taken to relieve the tax burden on the MSME sector. She also approved of the measures taken by the government on the ‘ease of doing business’ front. She specially mentioned the change in FDI policy- scrapping of FIPB (Foreign Investment Promotion Board) and how it will help to bring in more FDI in the country. Mr. Garg emphasised that this was definitely a growth-oriented budget and was highly appreciative of the continuation of the tight fiscal policy. He also used the demand curve to explain how the spending on infrastructure will boost the entire economy. He spoke of the tax relief to the middle class and the positive impact it will have on the largest economic class in the country. He also lauded the Government’s efforts with regards to the simplification of the annual budget exercise. Mr. Dutta also agreed with the previous speakers that it was a very satisfactory budget but also pointed out some misses of the budget. He pointed out that the 10% additional surcharge on Rs. 50 lakhs- Rs 1 Cr. bracket was not really a sustainable policy and must be looked into in the future budgets. He also spoke about the lack of funds allocation to Healthcare sector, highlighting its importance in the Indian context. Prof. Dr. Venkatshwarlu spoke about the Indian economy as a whole- its needs and wants. He stressed on the need for a robust bonds market in India. The opening statements by the speakers were followed by a question and answer session. The majority of the questions from the students revolved around the health of the banking sector, the concept of Universal basic income (UBI), debt to GDP ratio and FDI policy. The speakers stressed that UBI as a policy has not been tested anywhere in the world, hence not prudent to implement it in the country. They also pointed out that it cannot co-exist with the current subsidy regime in India. Talking about debt to GDP ratio, Mr. Dutta explained that even though this ratio was high, credit was necessary for growth. The speakers agreed that Non-performing assets (NPAs) was an issue for the banking industry but also iterated that the health of banks was of utmost importance when considering the entire economy. The session was highly informative and helped the students of NITIE understand the nuances of this year’s Union budget. 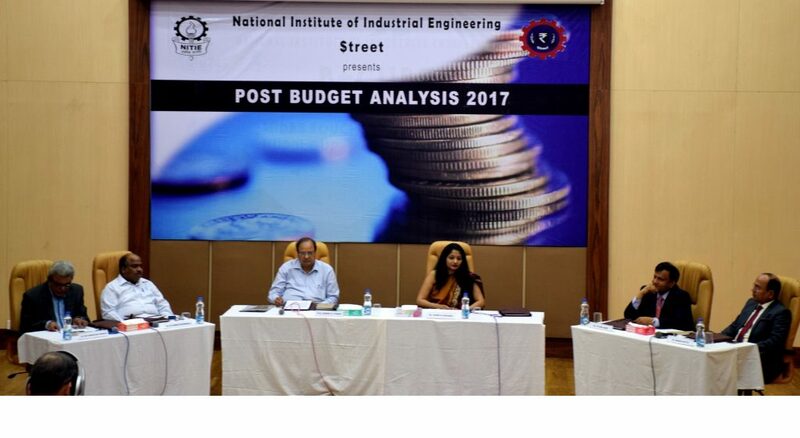 The panellists’ enriching thoughts helped in making the Post Budget Analysis at the institute a grand success.